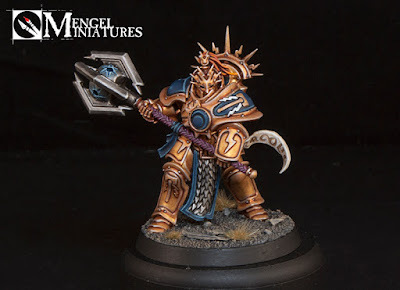 After I had finished my unit of Liberators I took a look at my Stormcast Eternals I had built to decide what was going to be next. 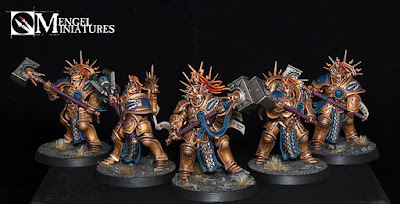 I wanted to do a character but decided that I should have more rank and file guys first, so after flirting with the idea of the Prosecutors for a bit, I decided on my Retributors, the heavy hitters of the force. One of the reasons I had originally chosen the Retributors is because there was only three of them and I figured they would go faster then the Prosecutors because they didn't have wings or extremely long parchment strips to paint. Well, as I was approaching finishing up the gold on my original three I caved and ordered some more off eBay as well as a bit for the Starsoul Mace. I knew I would want a full unit of five eventually along with the mace, so might as well get it done with at the same time. I painted these guys similar to how I approached the Liberators. They were all sprayed with the Retributor Armor spray paint, tidied up with the paint pot version and then washed with Reikland Fleshshade at the same time. After this I approached the gold on each of them separately. The main reason I do this is so I don't burn myself out. 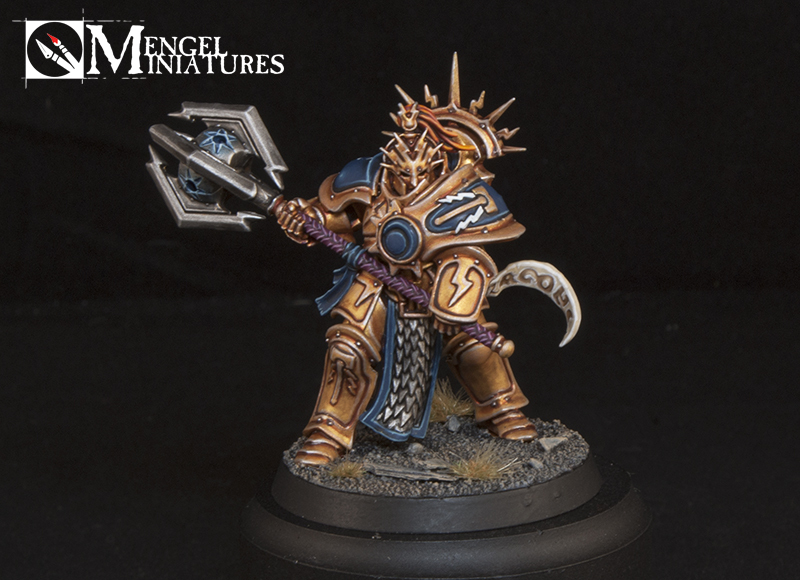 If I had to sit down and do the first layer of Auric Armor Gold on all five of them at the same time before moving on to the first highlight I think I might go crazy. I also tend to start getting sloppy if I paint models in that way, as I get exhausted and frustrated with that color. 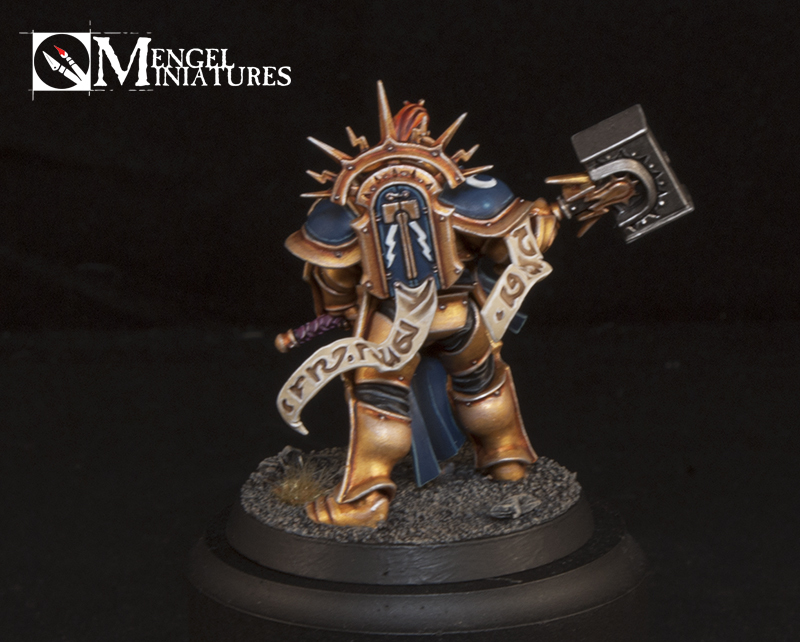 This way I get to focus on each model, make sure they are all to the level I want them at, but still get all of the gold done before moving onto the next color. It's kind of like a pseudo batch painting process. 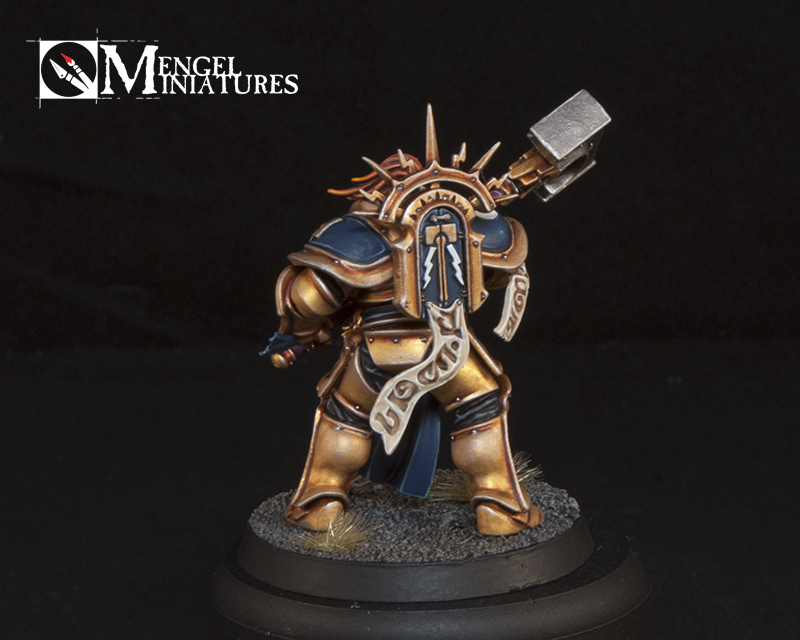 I am painting the gold on all of them at the same time, but I am just doing each one individually. 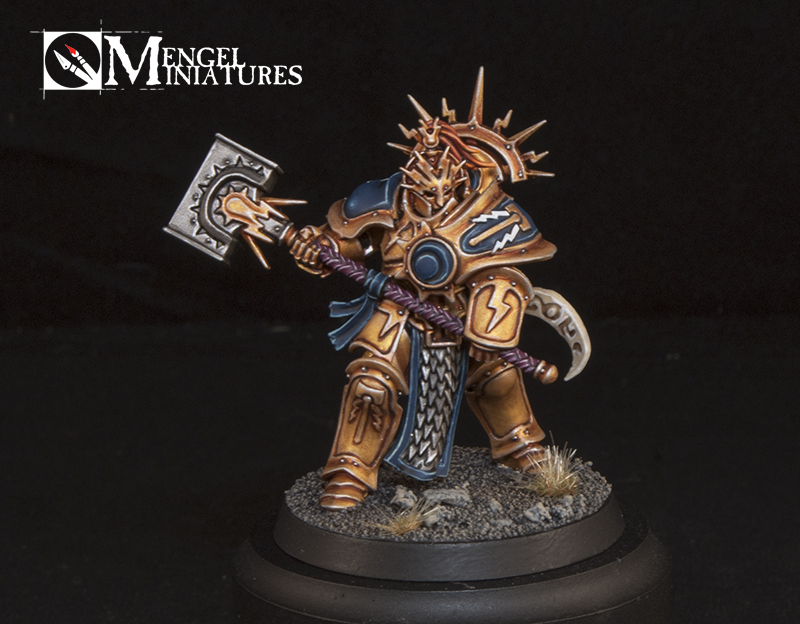 You can see how I painted the gold here in this tutorial. Once the gold was done I moved onto the next more prominent color, the blue. 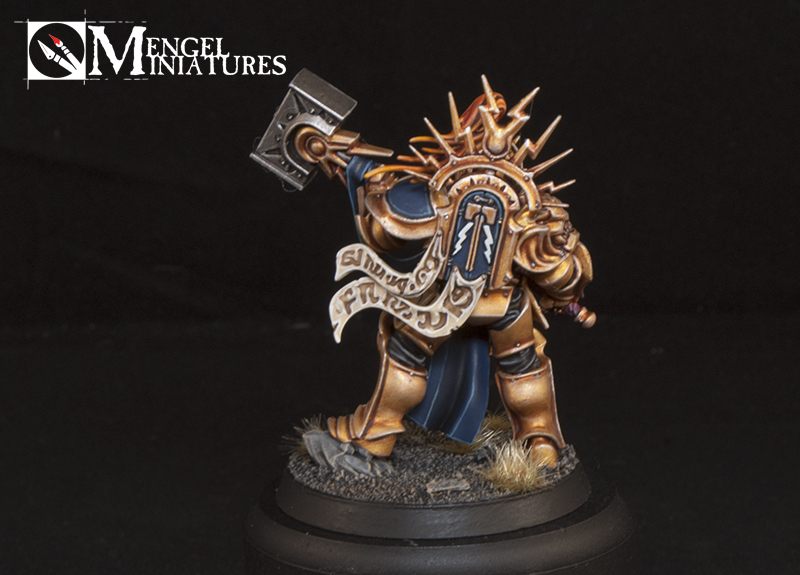 I approached this in the same way as the gold, painting each model individually. Although I would base coat two at time here or there, as well as shade a few at a time. This is because there is less blue and I run less of a risk of getting tired of it. I do still highlight each one on it's own though. The blue is Kantor Blue, shaded by mixing in black and highlights by mixing in Screaming Skull. The little light flares on their shoulder pads is probably one of the most time consuming individual parts of these models. There is just a lot of going back and forth between the different stages to make sure the blend is smooth enough and the highlights bright enough. 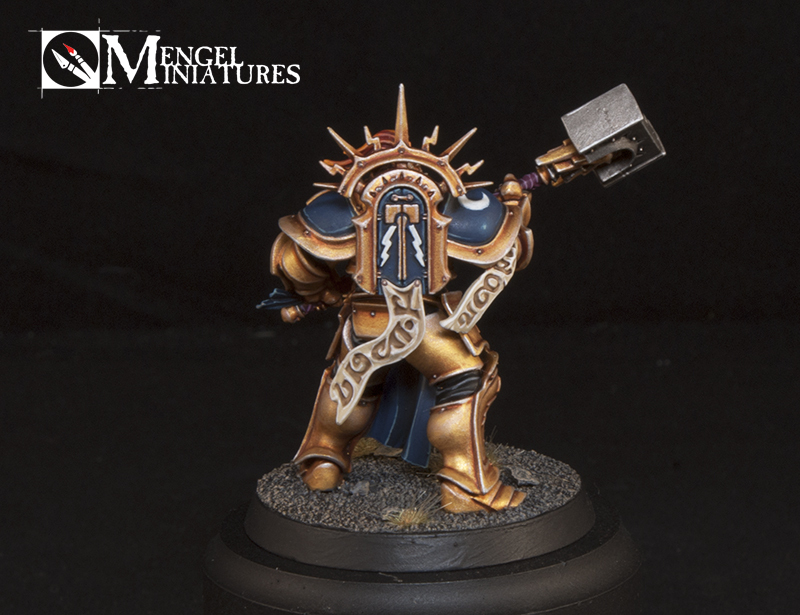 I then decided to do the hammer hafts next since they are much larger then the ones on the Liberators. These were all base coated with Screamer Pink and then shaded with Nuln Oil as a group. The highlights were just tidying up with the base color and then adding in Screaming Skull for two different stages. Next up was the silver metal. Again, they were all base coated and shaded together before moving on to doing each one on its own. I used P3 Armor Wash around the rivets, any hard lines, and on the tabards. The more gentle crevices on the hammers got hit with Nuln Oil. 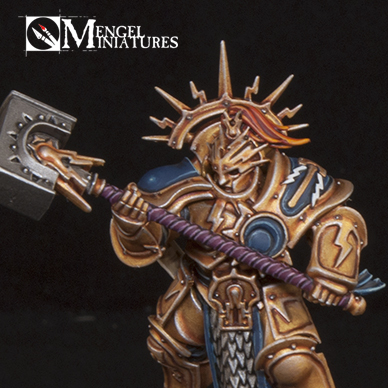 The P3 Armor Wash provides a much starker and darker shade then the Nuln Oil, so is perfect for when you want to really define a line. 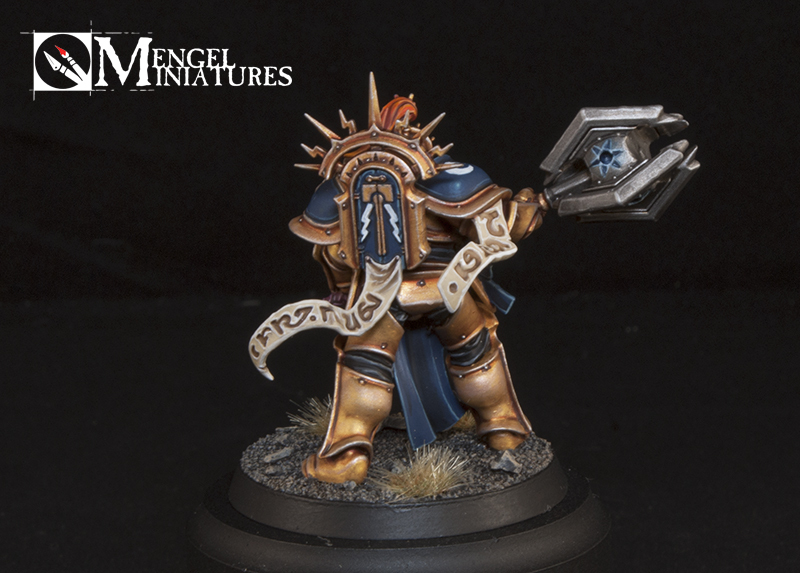 The mace got a little more attention then the rest of them and I had to play around with a few different techniques before I was happy with the glowing star emblems on it. I also added a bit more definition with Nuln Oil in select spots. After that it was just finishing up the remaining colors. 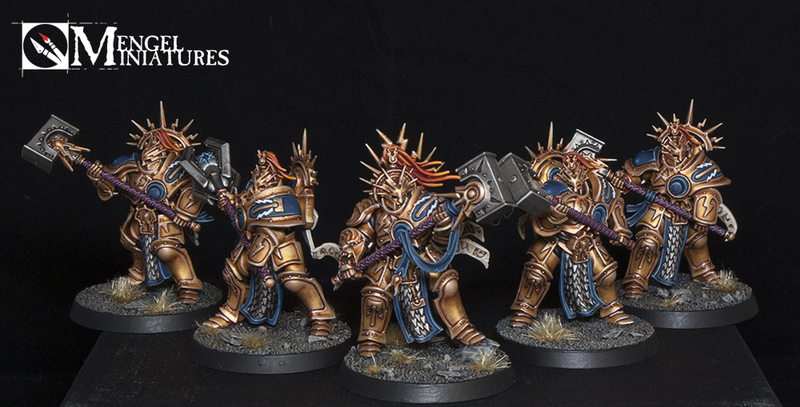 I like how the plumes turned out on these guys more then on my Liberator-Prime. They have more of an orange look to them then red, which is what I want. The main difference is that I added a final highlight of Blazing Orange/Screaming Skull to it. 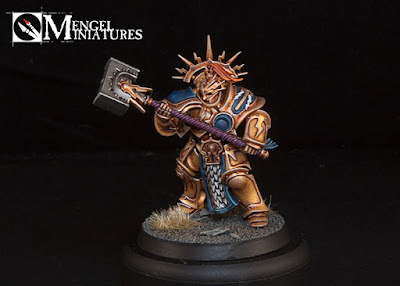 What other color areas on the Stormcast Eternals would people be interested in seeing step by step tutorials for? I have already done the gold and would be more then happy to do another color on my next unit. Let me know in the comments below. Here is a quick army shot of what I have painted so far. 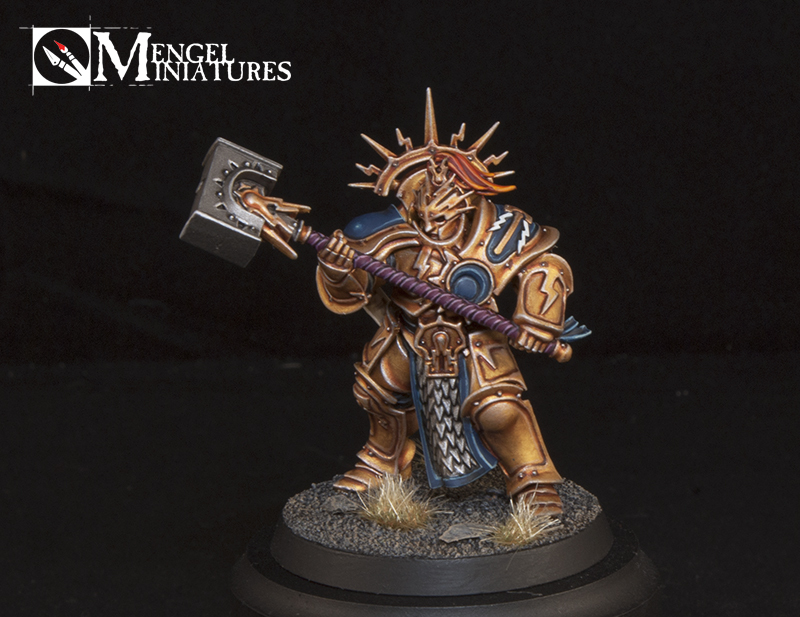 I think a character is next, but I need to work on some Tomb King stuff before that to be ready for Adepticon. After I do the character I'm thinking of getting the Prosecutors done. 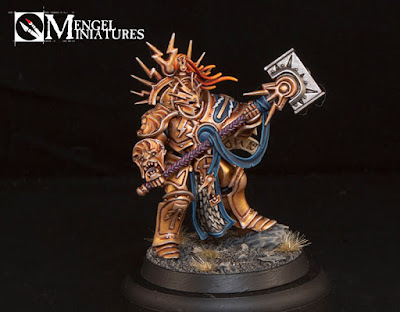 I played a game with my Stormcast this past weekend and the Retributors wrecked face just like I expected them to. It's nice to have your freshly painted unit preform well instead of just dying like what usually happens. Be sure to watch the video below for a 360 degree video of the whole group. The music is once again provided by Adam Harvey, you can follow him on his Facebook page and listen to some more of his music on his Youtube channel. Enjoy! Be sure to vote for them on Cool Mini or Not here.